Note: This feature is currently only in Lion Dev Previews, but it will likely come to a Safari update for existing versions of Mac OS X in the near future. 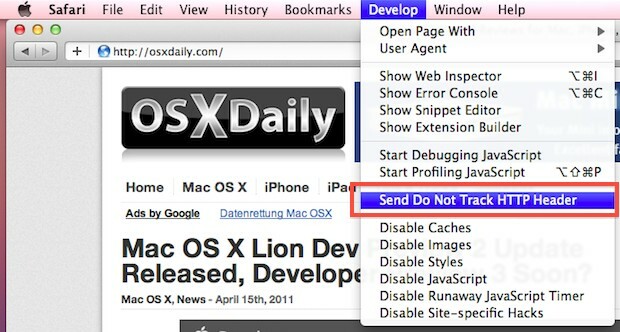 Safari 5.1 in Mac OS X Lion Developer Preview 2 has added a new feature that blocks cookie tracking used by online marketers. Cookie tracking may sound more nefarious than it is, because the general goal of tracking your web activity is to serve the most relevant ads to you. This is why when you look for a product online and check out that products web site, suddenly advertisements for that product are appearing elsewhere on the web afterwards. Personally, I’d rather have ads that are geared towards me and things I’m interested in than some of the generic and annoying advertising out there. Show me ads for Apple products, not ads for generic Windows virus and Registry scan crapware, and this is the kind of ad targeting cookie tracking enables. I’ll elaborate more on this later, but nonetheless, I think the more control you have over your browsing activities the better, so I’m happy to see the do-not-track option appear in upcoming versions of Safari. Changes seem to take effect immediately but you should clear your Safari Cookies first to really see the difference. I finally got a chance to try this out after seeing the feature mentioned a few days ago on MacGasm, and the good news is that it works as you’d expect. With the Do Not Track HTTP Headers enabled, the advertising presented to me across the web was much more generic and I no longer had ads that were geared towards me based on cookie tracking. Here’s the bad news, yes you gain some anonymity, but you also gain a barrage of generic Windows registry/virus/just-buy-a-freaking-mac-save-yourself-the-headache-of-this-rubbish scammy crapware ads again, amongst some other completely random annoying advertising. After seeing all of this, believe it or not, I quickly missed my cookie-targeted ads for things I’m interested in and use, like Mac Mini colocation, ZAGG iPhone Shields, Apple products, and software I use. For me, this proved that not all cookie tracking is bad, and I actually disabled the Do Not Track feature. The reality is that online advertising supports virtually all websites, including this one, so if I’m going to support sites I like and see ads, at least show me something relevant. I realize not everyone is going to share my opinion on ad relevancy and cookie tracking. If you’re really paranoid about online tracking and want the ultimate in web browsing privacy on a local machine without using an anonymizing proxy, you’ll want to go further than just using these do-not-track features. Combine do-not-track alongside with Private Browsing in Safari, then install some ad blockers, use ClickToFlash, or better yet, uninstall Flash completely and delete your Flash cookies to prevent Flash ads from following you around too. There’s even more you can do, but that’s a start. Calling your readers ‘paranoid’ is never a good long-term approach to keeping your audience. Marketing on the internet is insanely invasive and will continue in an ever more aggressive fashion. You probably have a strong facebook/twitter/linkedin/etc/etc/etc presence believing you have a life. All ‘social media’ is designed to sell you more crap. ‘Social media’ will collapse in on itself when it crosses the line and even the densest lemming realizes they have been manipulated and their personal data is no longer personal and private.